Construction Site BMPs are products designed and manufactured for job sites. Offering options to address spills, filter runoff and absorb oil, these products can meet the varying concerns and requirements of your location. Options include pop up containment pools for emergencies, pallets/filter decks for storage, containment sumps for large tanks, gravel bags, drain guards, and more. Please	feel free to browse through our listing below or contact our team at 1-772-646-0597. Spills are one of the biggest concerns for sites handling or storing hazardous materials. To help address these concerns, GEI Works offers several construction BMPs that can quickly capture and contain liquids in the event of a spill. Spill Basin: Portable and quick deploying mini spill basins are an ideal spill containment option to keep sites in compliance in the event of a spill. The mini spill basin opens in just seconds, and is easy to transport and durable. Containment Sump: The Spill Containment Sump is one of the most popular options for the storage of fuel tanks, oil tanks and other hazardous materials. Available options include 275 gallon, 500 gallon and 1,000 gallon models, each designed to offer 110% containment of the stored tank. Pop Up Containment Pool: For locations that require a quick spill collection area, Pop Up Decon Pools can be the perfect option. Designed with a self-rising top, these pools can be placed directly under a leak or spill to catch liquids as they collect in the tank. These pools are commonly placed under tanks, valves, and other storage containers for fast emergency response. Filter Decks: Spill Filter Decks are a reliable option for any location storing vessels, 55 gallon drums or other spill equipment. Made from a rigid poly material, these decks are robust in nature and equipped to successfully contain/store liquids in the event of a spill. While many of our construction BMPs are designed for use directly under spilled materials, we also offer a range of products that can help with spill control and cleanup around and inside of drains. These products can block off drains or sensitive areas as well as absorb small amounts of oil that may have entered a water system. Spill Berm: The spill berm is a high resistance polyurethane that is placed around storm drains to prevent debris and polluted water from entering the drain. Similar fabrics are also available to help temporarily seal off the entire drain grate. Passive Skimmer: The passive skimmer is made from a polymer absorbent and is designed to passively absorb oil located inside the drain. These lightweight floating products sit on the top surface of the water and can absorb up to 2 gallons of oil. 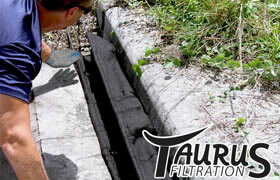 Dealing with contaminated water or floodwater can cause unnecessary erosion or ground contamination. These supportive construction BMPs can be placed around water storage areas (such as dikes) or along banks to help control and contain water. Triangular Silt Dike: The woven polypropylene triangular silt dike is an economical way to control erosion in streams, ponds, or check dam areas. The barrier's apron has often been installed along the sides of ponds and in small streams for erosion control. Construction Site Fence: The erosion control silt fence is one of the most reliable construction bmps for silt or sediment control around a construction site or work area. Designed from a woven fabric material, these fences contain sediment while still allowing water to filter through the material. Fencing is available in standard wire back orange safety materials and is typically sold by the pallet.